There are about 200 different owl species. Owls are active at night. This is called nocturnal. Most owls hunt insects, small mammals and other birds. Owls have powerful claws, called talons. These help them catch and kill their prey. The colour of owl’s feathers helps them blend into their environment. This is called camouflage. They have wide wings, lightweight bodies, and feathers specially designed to allow them to silently swoop down on prey. Depending on the species, adult owls hoot, screech, or whistle. Barn Owls eat mostly voles, shrews, mice and sometimes rats. Food is often swallowed whole – bits of fur and bone are then regurgitated (coughed up) as an owl pellet. Barn Owls screech – they never hoot (that’s Tawny Owls). The scientific Latin name for Barn Owl is Tyto alba alba. Barn Owls have very long legs, toes and talons to help them to catch prey hidden under long grass. Barn Owls usually hunt at night – even in total darkness they can find the smallest vole using their super-sensitive hearing. Barn Owls’ large eyes are very sensitive too – they can quickly spot a mouse moving in a very gloomy barn. waterproof and get soaked if it rains. Barn Owls have lop-sided ears! One is higher than the other, which helps them to pinpoint exactly where tiny sounds are coming from. A wild Barn Owl usually eats about 4 small mammals every night, that’s 1,460 per year! Owls moult their feathers in spring and grow new ones. You might find old feathers that have fallen out lying on the ground under the owl’s perch. One of the earliest cave paintings made by people living in France in prehistoric times shows Snowy Owls. The ancient Greeks believed that owls were wise and kind. The Greek goddess of wisdom, Athena, is often shown holding an owl. The hoot of an owl has often been considered to be bad luck or a bad omen. This came about because when Vikings had surrounded a Saxon village, they would call like owls to each other as a signal to attack! People used to believe that owls could turn their heads all the way round in a circle. They thought that if you walked round and round a tree that an owl was perching in, the owl would keep turning its head to watch you until it strangled itself. A dead owl nailed over the door of a house or barn was believed to act as a lightning rod. People thought that the lightning would strike the owl and not the building! Even now, some important buildings still have statues of owls on their roofs. Owls can also be seen on heraldic crests, like the ones knights used to bear on their shields. Leeds City Council still has owls as part of its crest. In heraldry, an owl is often a symbol of wisdom. Soft feathers so that the owl makes no noise when it flies. Owls spend lots of time preening their feathers to keep them tidy. While caring for its young, a short-eared owl will perform an "injured bird" act to lead away intruders. During courtship, male short-eared owls will fly high over the nest, calling, flapping, soaring and occasionally swooping while clapping its wings below its body. Short-eared owls generally roost on low perches or on the ground. While short-eared owls dine on small mammals and an occasional small bird, they prefer meadow voles. 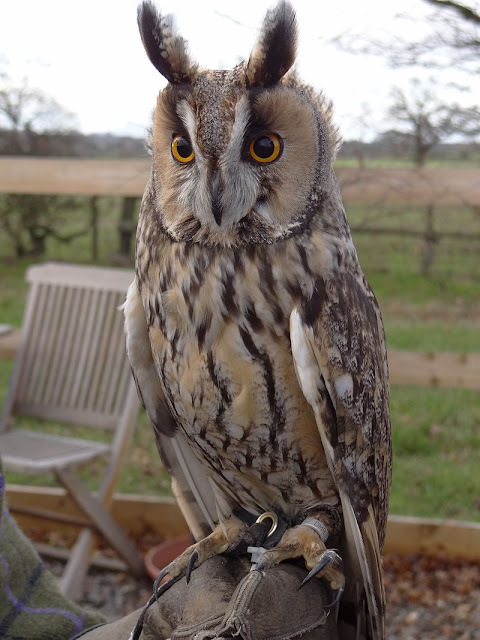 The long-eared owl is a slender, crow-sized owl with long “ear” tufts atop the head that are often visible when the owl perches. The ear tufts are not actual ears, but rather clusters of feathers that aid in camouflaging the bird. Snowy owls are relatively long-lived, the oldest known banded owl was recaptured and released alive at an age of 19 years and 7 months. Some captive birds have been recorded living up to 28 years!